This is nothing ground shattering as far as CFC's go, but I think it's an improvment on the BYO design. There is a slight increase in cost, but I think it's easily offset by the increase in durability and ease of assembly (no JB weld). The difference is how the tees are built, where they used rigid copper tees I swapped them out for threaded tees and hose barbs instead. 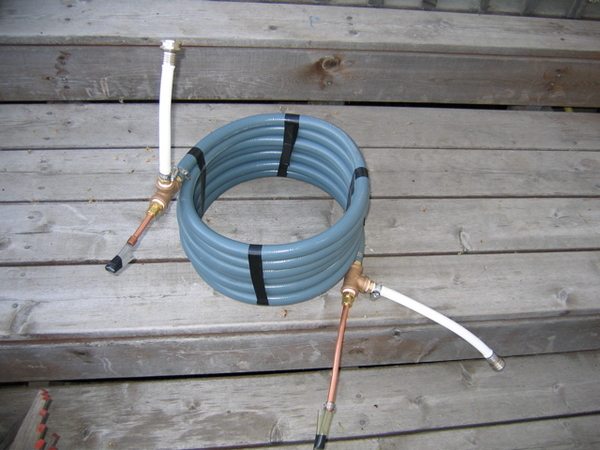 Start by cutting about 8" off both ends of the garden hose. 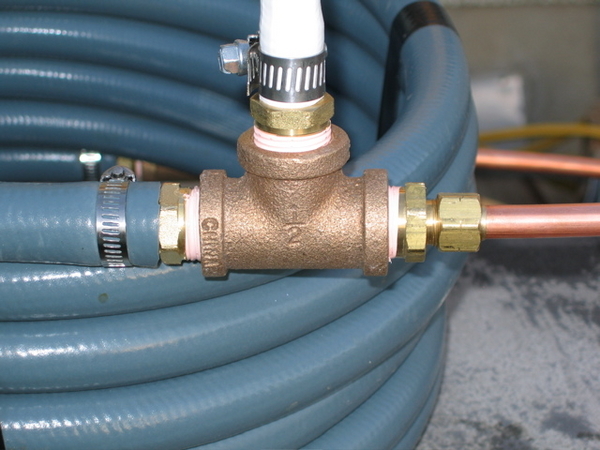 Use your guile and get the copper tubing insde the garden hose, it's easier if you straighten both out first. Next drill out the centers of the compression fittings so the tubing will slide through them. Drill from the 1/2" threaded side to avoid damaging the ferrule seat. Tighten everything until there are no leaks and you're done.